New York City Mayor Bill de Blasio holds a press conference to announce a definitive plan to close the Rikers Island Correctional Facility within ten years, in New York, March 31, 2017. Albin Lohr-Jones/Press Association. All rights reserved.For the first time since the 1950s, fewer than three hundred murders were recorded in New York last year. The number of manslaughters, rapes, assaults, robberies, burglaries, grand larcenies and car thefts also reached a historic low. In total, fewer than 100,000 of these serious crimes were reported. Compare that to 1990, the worst year on record, when police tallied 2,245 homicides and more than 520,000 major felonies. A fivefold reduction in crime is a huge achievement, without precedent in the developed world. It is easy to forget that New York was once synonymous with urban decay and inner city violence. Speaking on All Things Considered as the year drew to a close, Bill Bratton, who served as Commissioner of the New York Police Department (NYPD) from 1994-96 and 2014-16, was understandably happy to claim some of the credit. Police “began to focus on disorder, which had not been addressed at all in the '70s and '80s, and disorder is described as broken windows, quality of life, minor offences,” he said. The effectiveness of ‘broken windows’ policing remains a matter of considerable debate. Crime rates have plummeted across the USA, a trend variously attributed to demographic shifts, legalised abortion, banning lead in paint and petrol, the advent of debit cards, video games, and a generation traumatised by the crack plague. The latest statistics do debunk an argument favoured by law and order conservatives, though: that rising incarceration rates explain reductions in crime. New York has reduced its jail and prison population by half, thanks to effective grassroots advocacy and progressive policy reform, while becoming the safest big city in America. In 1991, almost 22,000 inmates were housed at the city’s notoriously violent Rikers Island jail complex. Last December’s average daily count was 8,980. State prison ledgers show an equivalent drop: in 1998, more than 47,000 city residents were confined ‘upstate,’ and by 2016 this had fallen to 23,000. Nationwide, the number of people behind bars has barely ticked downwards. If other cities and states can follow New York’s example, we could be witnessing the beginning of the end of the mass incarceration era. Tuesday morning in the Bronx Hall of Justice. A young African-American man with Tupac braids, dressed in a black aviator-style winter jacket and baggy pants, stands with his head up and his eyes down before the Honourable George Grasso. He has turned eighteen since his arrest, but has the sullen demeanour of a schoolboy caught playing truant, determined not to look scared. Half an hour later, on the second floor of the criminal court building a few doors down East 161st Street, I see the boy again, talking to an intake worker at Bronx Community Solutions (BCS). This is where people who would until quite recently have been sentenced to short spells in jail are now sent, by default. Almonte and her colleagues describe a gradual process of “buy-in” from judges, prosecutors and defence lawyers. Clerks have intake co-ordinator Willie Bernardez’s mobile phone number, and the BCS team is such a familiar sight in court that “the mindset is there’s got to be an alternative” to short jail sentences. People charged with drug possession, petit larceny, trespassing or riding the subway without a ticket generally plead guilty in the arraignment court across the hall and are sent straight to BCS, to arrange a day or two of community service and a counselling session at the clinic, where a social worker will assess their needs and help them find employment, housing, legal representation, job training, anger management classes or therapy, as required. The punishment for failing to complete the community service or pay a fine is capped, by consensus, at fifteen days in jail, and in practice, most judges are willing to offer multiple extensions. As Almonte puts it: “they see we need another opportunity because we only cracked the egg just a little bit.” Almost three-quarters of offenders facing short sentences are unemployed, and almost half are homeless. Many have problems with substance abuse and have been arrested over and over again. “I think we’re seeing a much more nuanced and sophisticated understanding of how to create proportional sentences that are better for victims, communities and defendants,” says Adam Mansky, director of the Centre for Court Innovation, which oversees BCS. In Manhattan, this evolution has been formally recognised and given a name, newSTART (each of New York’s five boroughs has its own court system and District Attorney.) Sentences of less than ten days have been eliminated, by agreement. The Center for Alternative Sentencing and Employment Services (CASES) has been granted funding to serve 1,700 people, up from 1,000 last budget, and Assistant District Attorneys are trained to recommend its services. Three-quarters of the men and women at Rikers Island are in pre-trial detention (Kalief Browder, a sixteen year old accused of stealing a backpack and held for three years before being released without charge, came to symbolise the base injustice of the bail system.) 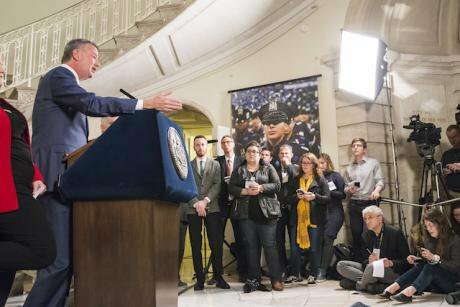 In 2016, Mayor Bill De Blasio committed to a $17.8 bail alternative programme, and Governor Andrew Cuomo recently announced that New York state will no longer seek cash bonds for minor offences. Supervised release programmes, earned parole eligibility and a steep reduction in felony drug arrests have also helped to empty prisons. “We’re participating in a sea change in the thinking of the criminal justice system - certainly courts, prosecutors, also the police department is much more open-minded to working with the court in innovative programmes,” says Grasso, who became a judge after rising through the ranks of the NYPD. In August 2013, District Court Judge Shira Scheindlin ruled that the NYPD’s stop and frisk programme was racially discriminatory and unconstitutional. In his mayoral campaign the same year, De Blasio promised to reform the practice, which disproportionately targeted black and Hispanic men, and was rewarded with a series of New York Post headlines predicting a return to the city’s bad old days if he were to be elected. The newspaper continues to attack De Blasio, but the predicted crime wave has not arrived. “The city scaled back stop and frisk, crime rates continued to go down, and I think that involuntary change, coupled with all of the purposeful reforms the city and the state have implemented that have not harmed public safety, has really helped people to see that it’s possible,” says Nazgol Ghandnoosh, a research analyst at the Sentencing Project. Jahkeiff Myrick. Author's photograph. All rights reserved.In June, De Blasio signed eight bills into law that establish a civil penalty scale for minor violations and encourage police officers to issue a civil summons rather than make an arrest or issue a criminal summons for littering, urinating in the street, jumping the train or drinking alcohol in public. Three months later, the city released figures showing that compared to the previous year, officers had issued 50,000 fewer criminal summons, and written only 26,000 more civil summons, suggesting that many more misdemeanours went entirely unpunished. The city is not ready to give up the rhetoric of ‘broken windows,’ but in practice, it is backing away. At the Bronx courthouse, I was introduced to a BCS client, Jahkeiff Myrick: “J as in Jack, A as in apple, H as in handsome, K as in Keith, E as in Eric, I as in igloo, and two letter Fs at the end.” In November, he was busted trying to shoplift two jackets from Marshall’s department store and charged with petit larceny, not for the first time. 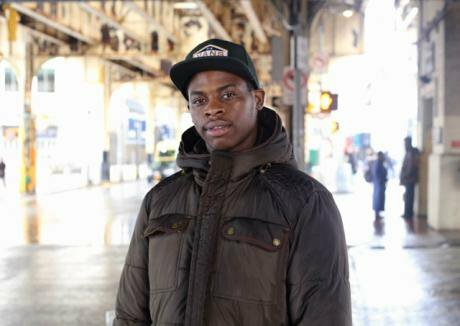 “If I had a job, I wouldn’t be putting no type of clothes in the bag and trying to walk out without paying for it,” he told me. “I needed the money. I felt like there was no other way.” He had been unemployed most of the time since dropping out of high school six years ago. The American Civil Liberties Union has targeted a 50% reduction in the number of people behind bars nationwide. Conservative group Right On Crime has joined an emerging bi-partisan consensus that the USA locks up too many people, and gets a poor return on the tens of billions spent on prisons each year. “As a society, we’re seeing more people coalescing around the idea that incarceration can be counter-productive,” says Mansky. De Blasio has committed to closing Rikers Island within ten years. To do that, the jail’s population will have to be cut by almost half again, to below 5,000, so that the remaining inmates can be housed in smaller community facilities. If the city can follow through on the plan, and crime rates stay low, the empty jail complex will stand as a monument to the mass incarceration era in New York, and perhaps even signify the beginning of a more rational, humane approach to criminal justice in the country as a whole.